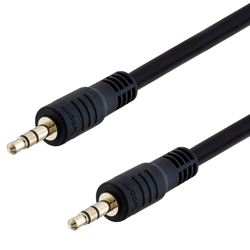 L-com Global Connectivity, a preferred manufacturer of wired and wireless connectivity products, announced today that it has released a new line of 3.5mm audio cables with low-smoke zero-halogen (LSZH) cable jackets and connector overmolds. The new VMA00001-series LSZH cables are perfect for use in applications where it is critical to protect people and equipment from toxic smoke and corrosive gasses and where PVC cannot be used. In addition to LSZH cable jackets and overmolds, these new cables feature gold-plated center contacts to minimize signal loss and provide distortion free audio transmission. “Many of our customers now require cable assemblies that are constructed with LSZH compound in order to adhere to stringent fire codes. In the past, these types of cables were only available as custom order parts with long lead times. To address our customers’ requirements, we now offer these cables off-the-shelf for same day shipment,“ said Brian Gates, Product Manager. L-com’s new 3.5mm LSZH audio cables are in stock and available for immediate shipment.